Radcliffe holds his own as Ginsberg, and the other actors all play their parts reasonably well (especially Foster who really nails William Burroughs’ vocal inflections). While an interesting story, it doesn't draw the watcher in and seems more like romanticized fiction than fact. At the beginning of writer-director John Krokidas’ Kill Your Darlings, it’s difficult to tell the film’s main character is future Beat poet Allen Ginsberg. Allen (Daniel Radcliffe) seems very docile and removed from life, catering to the whims of his mentally ill mother (Jennifer Jason Leigh). With the blessing of his father (David Cross), he decides to make a break for it by going off to school and that’s where and when everything changes. The film’s strength is that it shows Allen’s early evolution. Its weakness is that it doesn’t know where to go from there. When Allen (Daniel Radcliffe) arrives at Columbia University, his instructors resist his inquiries about changing the standards for intellectual thinking, but he’s not acting in isolation. 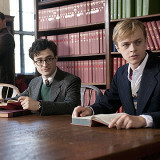 He quickly befriends fellow classmate Lucien Carr (Dane DeHaan), a real troublemaker who shares his admiration for the poetry of Yeats and Whitman. The two inspire one another and at a party in New York, Allen meets guys like William S. Burroughs (Ben Foster) and David Kammerer (Michael C. Hall) and begins to write poetry. After one wild night during which he, Lucien and new friend Jack Kerouac (Jack Huston) borrow a boat, he ends up on academic probation. Undeterred, he continues to create waves with his band of brothers, even breaking into the school’s library to steal the books that have been put on the “restricted” list and replacing them with much more explicit works. But this is a coming out story on many levels. It’s Allen’s emergence as a rebel focused on a “new vision,” as a future literary figure and as a gay man. Struggling with his sexual identity, Allen is attracted to Lucien. His affections seem to be exploited rather than requited. Things take a dramatic turn when David and Lucien go through a bitter falling out and Allen and Jack get stuck in the middle. It’s at this point that the story, though true, begins to unravel. Kyra Sedgwick makes a brief appearance as Lucien’s distraught mother Marian; her scene seems random and disconnected from the movie’s main storyline. Though Radcliffe holds his own as Allen, and the other actors all play their parts reasonably well (especially Foster who really nails William Burroughs’ vocal inflections), they can’t redeem the film. The surreal moments mean to mimic memory and emotional distress are forced. And, when the poets and writers literally toast to literacy and talk about leaving their “mark” on the world, it really distances the watcher and makes the movie seem more like romanticized fiction than fact.